Price Tip: If you hate negotiating and still want the best possible deal, always price shop online first. We recommend Car Clearance Deals, MotorTrend, CarsDirect and Edmunds. These free services will offer you the lowest prices on a new Jaguar and supply you with multiple competing price quotes. You will know the best price before you visit the dealer. Most people mistakenly believe that the Jaguar Invoice Price reflects what the dealer paid for a new vehicle - The true Dealer Cost. It is not! Knowing the dealer cost of a new Jaguar gives you needed leverage when it comes time to negotiate a great price. Negotiating from the cost up and not the MSRP down can save you thousands on your next purchase. MSRP stands for Manufacturers Suggested Retail Price, and is a phrase used to describe the selling price a car manufacturer recommends for its vehicles. MSRP is also commonly referred to as the list price, and is a way for people who are shopping for a new car to compare prices. Although car dealerships set their own prices, knowing a car's MSRP is an excellent way to know much a person may have to bargain and how much they may end up paying. The dealer invoice price is the amount a car dealership pays the manufacturer for a car. This is the amount the factory will charge for the car plus any additional accessories. 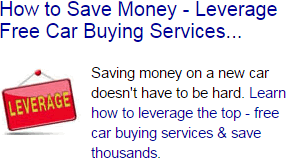 Usually, a car dealership will end up paying less than the actual dealer invoice price due to rebates and holdback. Dealer holdback is technically the amount of money the car manufacturer pays the dealership. This occurs because dealerships are forced to take out loans to buy the cars they put out on display to sell, so in order to make this deal cost effective for both sides, manufacturers pay dealerships the interest for the loans they were forced to take out. A manufacturers offers incentives and rebates to car dealerships to promote the sell of slow-selling cars or to make more room in inventory. Incentives and rebates save the consumer money by giving them one of the best possible deals. A destination fee is a non-negotiable fee that is the cost of transporting a vehicle from the manufacturers factory to the dealerships lot. The cost of a destination fee varies with each model, but not on location, and so it is unavoidable. Instead of the dealership taking care of this charge, it is usually passed over to the car-buyer. Dealer incentives are incentives given by the manufacturer to the dealership. A dealer incentive lowers the amount a dealership has to pay for a particular car to encourage the overall sale of a particular model within a specific region. Dealer incentives may or may not be passed on to the consumer. Regional advertising fees are usually non-negotiable fees that cover the amount the dealer must pay in advertising and promotions run by the manufacturer. Regional advertising fees are considered part of the dealerships cost for the car. 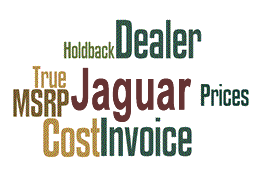 Base Jaguar Invoice Price + the dealer Invoice price of Options + Destination - Holdback = Total Dealer Cost.